Since 1994 Cup & Cross Ministries International has assisted churches across the United States and has strategically planned and developed a process which incorporates Bulgarian Evangelical Churches in North America. The first success of this endeavor was the establishment of the Bulgarian Evangelical Church of God in Chicago in 1995. 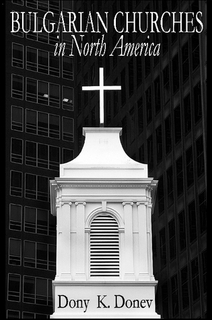 The Bulgarian Church of God in Chicago followed a rich century-long tradition, which began with the establishing of Bulgarian churches and missions in 1907. (read the history) Consecutively, our 1995 Church Starting Paradigm was successfully used in various studies and models in 2003. The program was continuously improved in the following decade, proposing an effective model for leading and managing growing Bulgarian churches. In the beginning of the 21st century the Protestant Church in Bulgaria is entering a new constitutional era in the history of the country. Since the fall of the Berlin Wall, the political and economic challenges in Eastern Europe have strongly affected the Evangelical Churches. More than ever before, they are in need of reformation in doctrines and praxes in order to adjust to a style of worship liberated from the dictatorship of the communist regime. In order to guarantee the religious freedom for our young, democratic society, the Protestant Movement in Bulgaria needs a more dynamic representation. Such can be provided only by people who will create a balance between the old atheistic structures and the new contemporary, nontraditional style of ministry. Similar is the case among Bulgarian Evangelical Churches in North America which also share analogue dynamics with congregations of Latin American immigrants. Several facts are obvious from such comparison. It is apparent that Bulgarian immigrants come to North America in ways similar as other immigrant groups. Large cities which are gateways for immigrants are probable to become a settlement for Bulgarian immigrants due to the availability of jobs, affordable lodging and other immigrants from the same ethnic group. The emerging Bulgarian immigrant communities share religious similarities and belongingness which are factors helping to form the communities. As a result of this formation process, the Bulgarian Evangelical Churches in North America emerge. It also seems natural to suggest that as this process continues, Bulgarian Evangelical Churches will be formed in other gateway cities and other large cities which meet the requirements to become a gateway city. Such has been the case with Latin American churches. If this is true, it should be proposed that the Bulgarian Churches in North America follow a strategy for church planting and growth which targets these types of cities. It is encouraging, at the same time, to observer that one of the positive estimates provided by our doctoral project is also coming to reality. 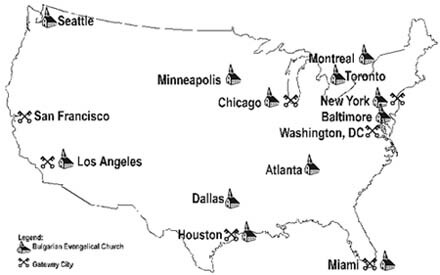 In 2002-2004, based on analyses provided by the New Religious Immigrants Project, our research suggested that the next Bulgarian Evangelical Church will be established in the last of the Seven American Gateway Cities which was still without a Bulgarian Church, namely the city of San Francisco. Our resent visit in the area of the Bay Area showed that this prediction is already progressing into a reality as the Bulgarian Diaspora there is already producing a Bible study group out of uniting Bulgarian college students from Barkley and young computer professionals in the area. Geographical Location of Bulgarian American Churches and Gateway Cities.